Habit: Shrub [perennial herb], green root-parasite. Stem: prostrate to erect, much-branched. Leaf: generally simple [1-ternate], alternate, crowded on short-shoots or not, sessile [petioled]; stipules 0; blade linear to ovate, hairy, glandular or not, tip abruptly pointed. Inflorescence: flowers 1 in axils [terminal racemes]; pedicel jointed, bractlets 2. Flower: bisexual, bilateral; sepals 4--5, free, petal-like, magenta, red-purple [yellow]; petals generally 5, 3 upper linear to clawed, free or fused basally, held in +- upright flag, 2 lower modified as glands; stamens generally 4, fused to flag base, upcurved, anthers opening by pores; ovary superior, hairy, style slender, upcurved. 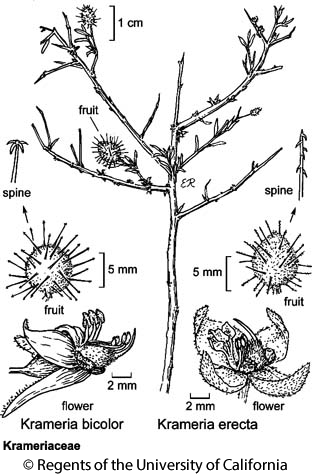 Fruit: nut-like, with smooth or barbed prickles; seed 1. Genera In Family: 1 genus, 18 species: America, arid semitropics, tropics. Note: Pollinating bees collect oils secreted by glandular petals. Habit: Densely canescent or silky-hairy. Stem: < 1 m; branches +- spreading, tips thorn-like. Leaf: narrowly lanceolate. Flower: buds curved upward; sepals deep purple-red; petal blades oblanceolate, green at base, magenta or purple above; glandular petals purple, outer face glandular covered with equal-sized blisters. Fruit: +- spheric. Synonyms: Krameria grayi Rose & Painter; Krameria canescens A. Gray, illeg. Citation for this treatment: Beryl B. Simpson 2012, Krameria bicolor, in Jepson Flora Project (eds.) Jepson eFlora, http://ucjeps.berkeley.edu/eflora/eflora_display.php?tid=91905, accessed on April 21, 2019.